The World Urban Forum (WUF) is a non-legislative technical forum convened by the United Nations Human Settlements Programme (UN-Habitat) held since 2002. FIABCI Americas International Global Summit, March 1 & 2, 2018, in Cancun. Network with the finest real estate professionals from the fastest-growing real estate sectors in the world and increase your FIABCI footprint. FIABCI World Congress 2018 is designed to be both informative and inclusive and will deconstruct the concept of Happy Cities through dialogue, panelist discussions, workshops, and an interactive exhibit and meeting spaces. Our fundamental aim is to engage the international real estate sector and provide a platform for visitors to Communicate, forge new relationships, learn and grow their businesses. The Mumbai International Emigration & Luxury Property Expo, a large-scale conference and exhibition dedicated to immigration and luxury real estate, will be held on 17-18 May 2018 in Mumbai. The biggest Proptech event in southern Europe. Attract new digital clients. Optimize your business management. Make a difference. The International Business Forum of Real Estate (IREBF) is the meeting place for those who manage the industry at the state level and those who design, finance (invest), build and sell real estate property around the world. With experts around the globe we’re on a journey to discover the business opportunities and potential of blockchain technology for our industry. Property Network is an international network gathering every 6 weeks around a certain theme. IREC 2018 is a premier International Real Estate Conference gathering experts and real estate industry influencers from all over the world to connect, learn, network, share and transact. All-Ukrainian Association "Ukrainian Society of Appraisers" and co-organizer FIABCI-Ukraine with the participation of representatives of the State Property Fund of Ukraine, the National Commission for Securities and Stock Market, the National Bank of Ukraine, the Guarantee Fund for Individuals Deposits, the State Geocadaster, the Antimonopoly Committee of Ukraine, the Business Ombudsman of Ukraine, the State Regulatory Service of Ukraine, international partners - TEGoVA, FIABCI, The evaluators of the self-regulatory organizations of Azerbaijan, Armenia, Belarus, Georgia, Kazakhstan, Kyrgyzstan, Latvia, Lithuania, Moldova, Poland, Romania invite you to take part in the XXIV International Science Pact The conference "Prospects for the Development of Property Valuation: Legislation, Deregulation, Methodology, Practice", which will be held September 6-7, 2018 in Odessa, at the address: Gagarin Plateau, 5. On September 13, 2018 at 18:00, the FIABCI-Ukraine Business Club will be held with Rusmin Lawin, Indonesia. The key speaker of the meeting - Rusmin Lawin is an active global entrepreneur from Indonesia and a real estate expert in the Asia-Pacific region, who has been working internationally for many years at the International Federation of FIABCI, representing his country, Indonesia. Rusmin will tell about the prospects of the Indonesian real estate and 10 New Bali tourism developments for a Ukrainian investors and developers. Attendance of FIABCI-Ukraine Business Club meeting for members of FIABCI-Ukraine is free of charge! 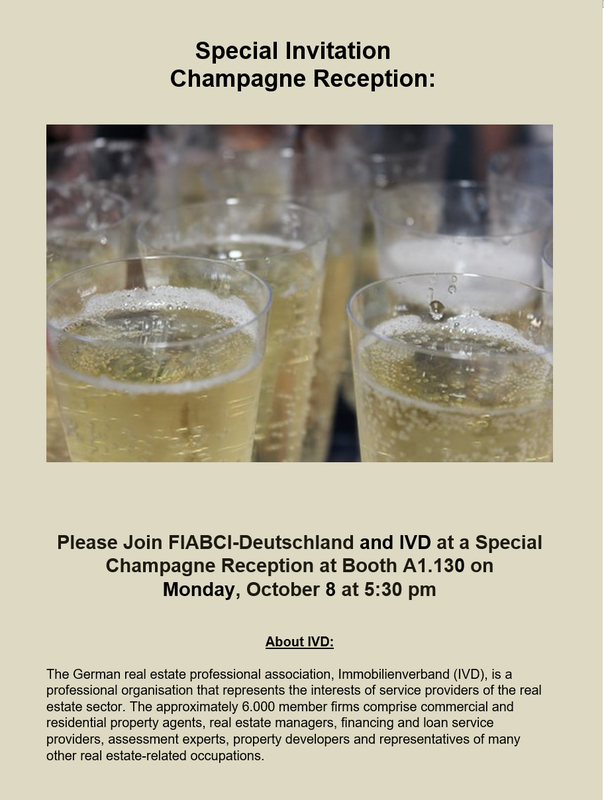 FIABCI-non-members can attend only by the exclusive invitations! The Big 5 Construct Egypt, the leading international construction event, launches in Egypt on the 18 - 21st of September 2018. The event will bring together influential decision-makers, innovators and suppliers from the region and beyond for four days of business and networking opportunities. The country’s booming construction market has placed itself as the leading contributor to GDP growth in the region with 473 billion dollars’ worth of active projects in the region, the majority of them are in Egypt. 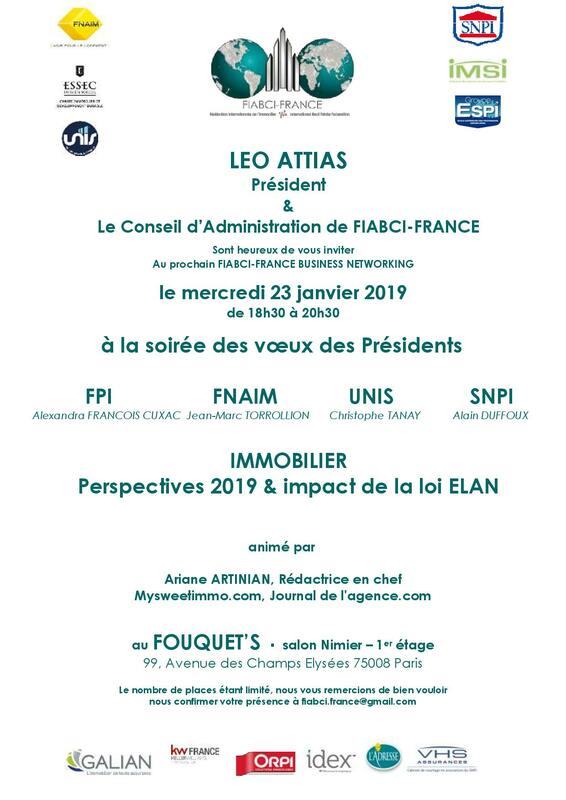 On 1 October, FIABCI-France President Léo Attias and respective Board will host a business networking event under the theme "Latest news on Real Estate Investment Funds". Arnaud Dewachter, General Delegate of ASPIM (L'Association française des Sociétés de Placement Immobilier) will also take part on the evening, which will be animated by Ariane Artinian, Independent Journalist and Editor-in-chief of Mysweetimmo.com, l'agence.com. The event will be held on Monday 1 October, from 18:30 to 20:30h, at 46, avenue George V 75008 Paris, France. The number of available spots is limited, so confirmation of attendance is required through the following email: fiabci.france@gmail.com. We welcome you to attend a unique event in conjunction with UN Habitat, FIABCI-USA and hosted by Bank of America, where a collection of New York's real estate experts will explore how governments, the business sector, citizens, and others respond to the challenges of providing sustainable livelihoods. "Solutions - A Global Dialogue on Affordable Housing: Policy, Finance, Technology & Sheltering" will take place at Bank of America Tower, 1 Bryant Park, New York, NY 10036, United States. 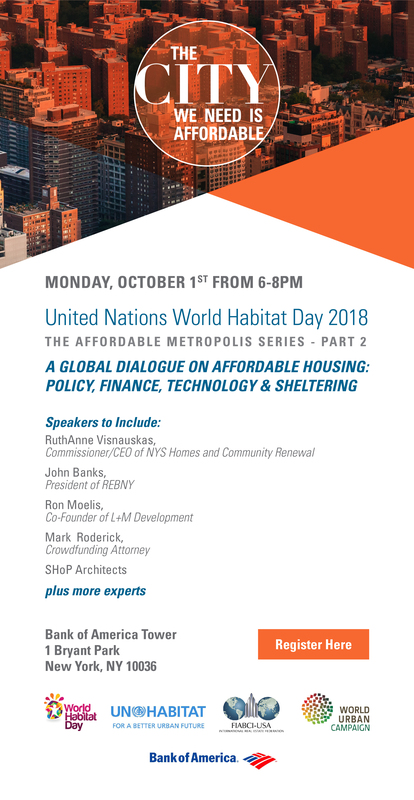 On October 1st, UN-Habitat Day, we will hold meetings in Jakarta (chaired by Rusmin Lawin), Paris (Nicolas Buchoud), Barcelona (Ramon Riera Torroba) and New York (Danielle Grossenbacher) to launch the initiative: A Global Dialogue on Affordable Housing: Policy, Finance, Technology & Sheltering. Financing solutions: public-private partnerships, international financing, crowdfunding, coins, etc. FIABCI INTERNATIONAL and FIABCI-Colombia invite you to celebrate the 20 year Anniversary FIABCI-Colombia's Prix d'Excellence. The Ceremony will take place in Cartagena, Colombia on October 5th at 7:30 pm. 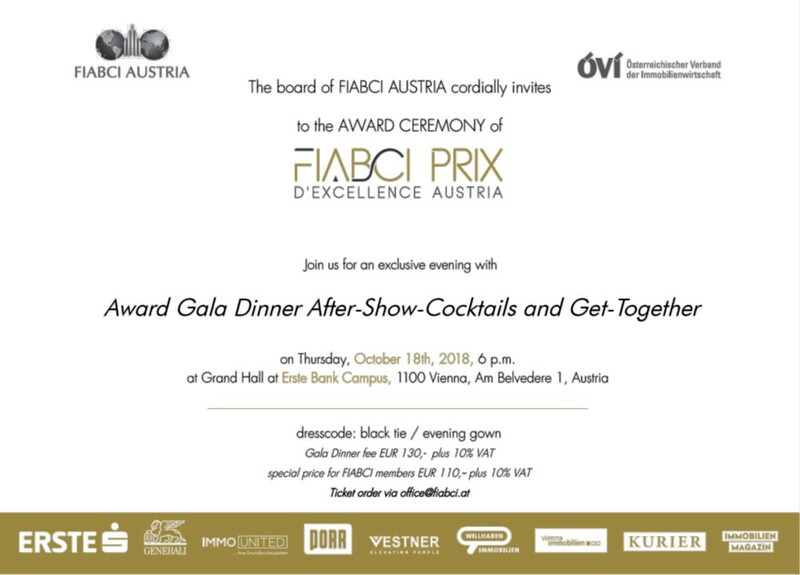 FIABCI Malaysia invite you to See, Experience and Gain First Hand Insight into the Creative Process and Winning Formulas that shape World-Class Developments, Worthy of the coveted FIABCI Excellence Award. You will hear directly from their creators! 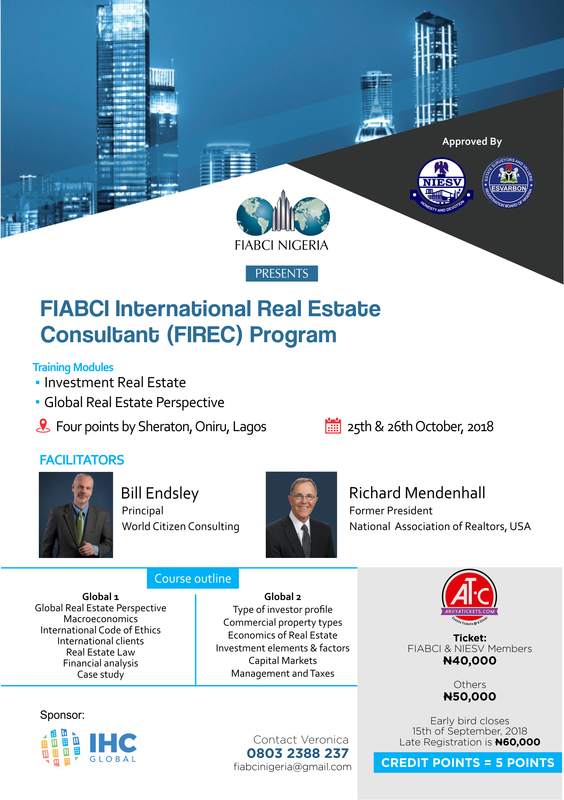 We encourage all developers, real estate practitioners, bankers, anyone with a stake in the property industry, whether you are into niche or mass market to take this golden opportunity to be part of FIABCI's inaugural study tour. NAR-INDIA, the apex national level Organization of realtors, after its highly successful 7th Annual Convention in Bangalore will now hold its 10th Annual Convention in Bangalore, India, on the 24th - 25th October 2018, at the Sheraton Grand, Whitefield, Bangalore, hosted by the Bangalore Realtors Association-India (BRAI). From 31 October to 1 November, FIABCI-USA will hold the General Membership Meetings at the Westin Copley Plaza, in Boston, Massachusetts. Next Wednesday, November 6, the young members team of FIABCI Spain are holding a brunch in order to attract other young professionals to joing our association. FIABCI Spain is about to carry out a program the aim of which is to increase the number of under-35 members working in Spain or other countries. Join FIABCI-USA Miami Council for an elegant cocktail party hosted by South Florida's top luxury developers! 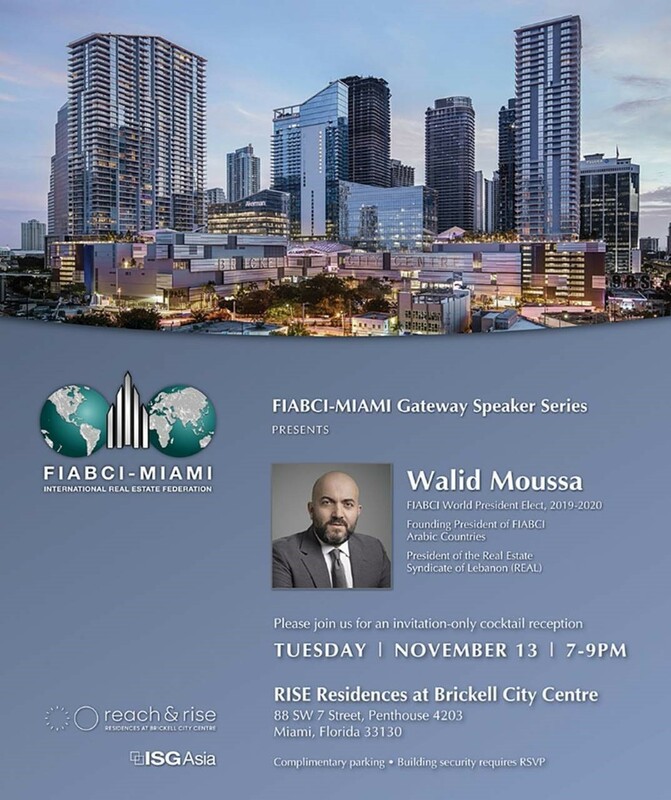 Mingle with and listen to global leaders of the international real estate industry brought to Miami for the benefit of our members. MAPIC is the leading international retail real estate event for key property players to build the ultimate retail and leisure mix in order to become a complete lifestyle destination. 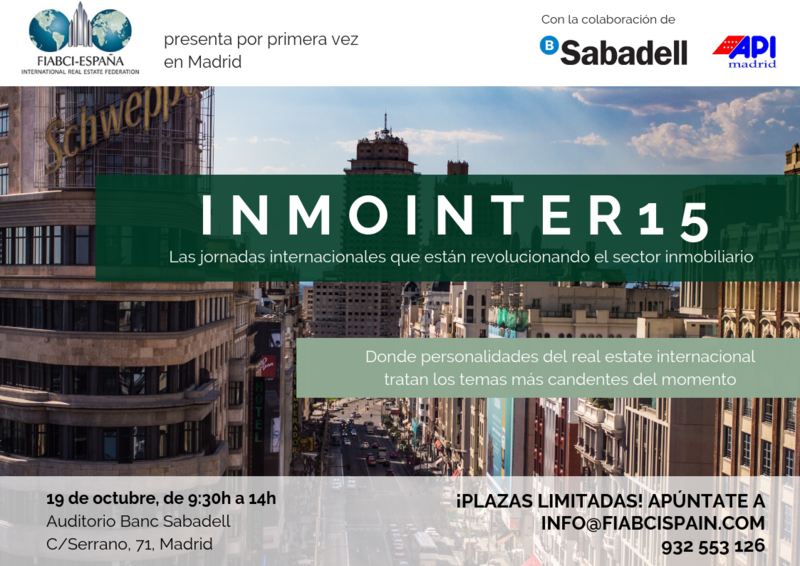 Un encuentro de más de 500 profesionales inmobiliarios de ámbito nacional e internacional, con conferencias, talleres, mesas redondas, exposiciones, demostraciones y networking profesional. The presence of women is very outstanding in the real estate sector. This is why our secon business breakfast is dedicated to this topic; a meeting where the most significant real estate women will be attending. The Kyiv International Emigration & Luxury Property Expo, a large-scale conference and exhibition dedicated to immigration and high-end real estate, will be held 26 and 27 November 2018 in Kyiv. Where Hong Kong, Hong Kong S.A.R. The MIPIM Asia Property Leaders’ Summit gathers top-level real estate professionals from all sectors to build partnerships, gain industry insight and discover the most outstanding projects through a world-class programme dedicated to property investment and retail real estate. On December 4th , starting at 12 noon, the traditional round table organized by FIABCI-BRASIL and its principal member Secovi-SP is going to be held to discuss the current national scenario and the "Market Prospects for 2019". In this edition of the event, participants will have the opportunity to get to know the opinions and analyzes of the journalist Fernando Miter, director of Rede Bandeirantes, and diplomat Rubens Ricupero, former finance minister. Detailed program and registration portal will be available soon on this website - Global Events / Global Business Summit. In light of the maiden budget from the new government, this short and comprehensive session would discuss on how the new tax changes would impact the property market as whole. Aside from the changes that were announced in the Budget 2019, the speakers would also share with the participants how the government may have changed the practices and positions of the relevant direct and indirect tax authorities for the property market going forward. 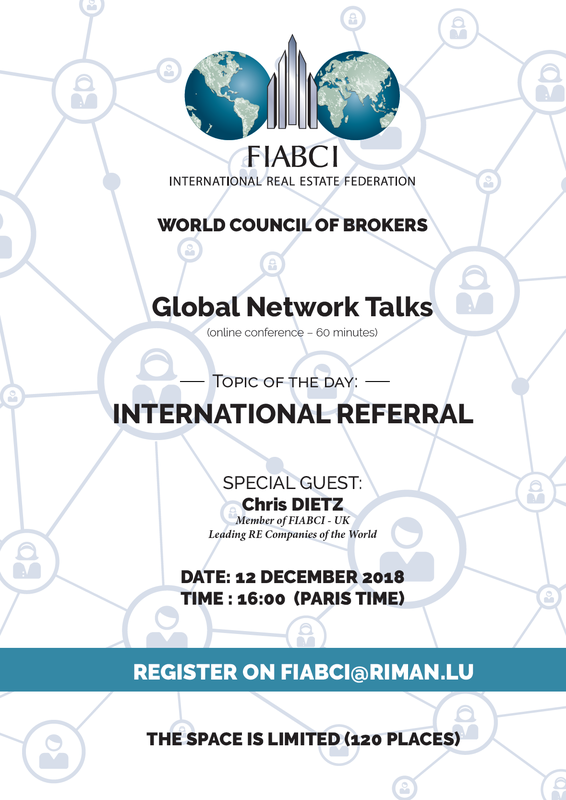 The FIABCI World Council of Brokers is proud to announce the first session of Global Network Talks, taking place on December 12, 2018 at 16h (Paris time). 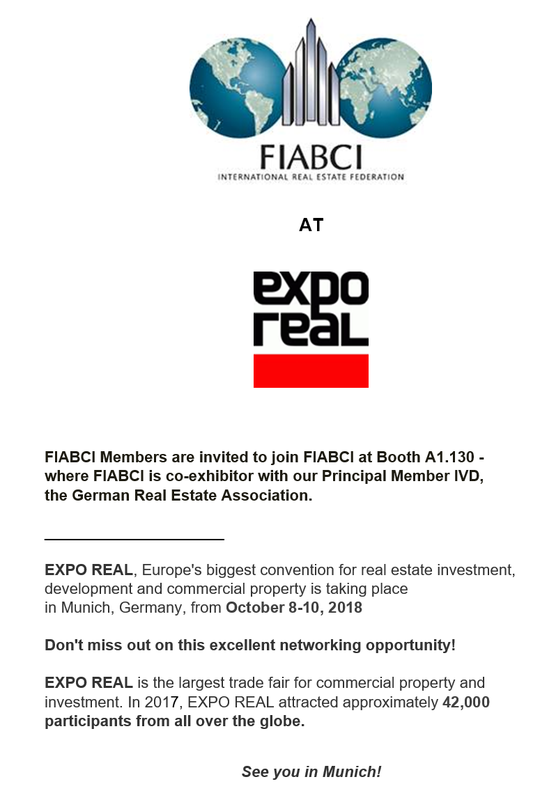 Chris Dietz, member of FIABCI-UK and Executive Vice-President of Global Operations at Leading Real Estate Companies of the World will speak about the topic of International Referrals. Registrations at fiabci@riman.lu (availability limited to 120 participants). Master Kenny Hoo of GOOD FENG SHUI predicted that 2017 was the ignition of "New World Order"and 2018 was the "Transformation of New World Order". How about 2019? Any good tips to be used as cross-reference, especially in the property sectors, to leverage the new opportunities in 2019? Come join and listen to the first-hand information and sharing by the world-renowned Master Kenny Hoo, to prepare for greater prosperity and happiness in 2019. Kick-off 2019 : Prognosis and perspectives of the Swiss Real Estate Market. 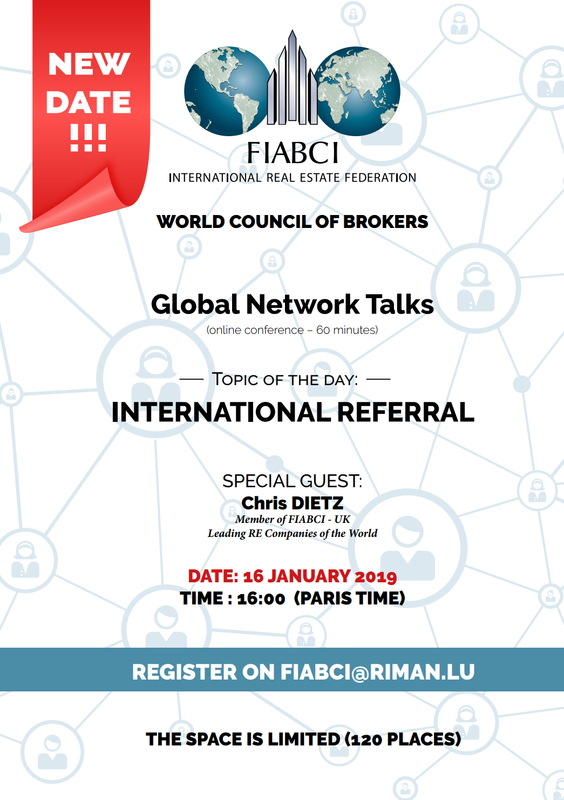 The FIABCI World Council of Brokers is proud to announce the first session of Global Network Talks, taking place on January 16, 2019 at 16h (Paris time). The Mumbai International Emigration & Luxury Property Expo is a large-scale conference and exhibition to be held 16 - 17 January 2019 in Mumbai, India. This is an annual charity visit to SEMOA (Strategic Education & Ongoing Advancement), a place where aborigines children are housed. taken care and sent to schools by the caretakers in the centre. Every year, FIABCI Malaysia will conduct a charity visit and donate some essentials to the centre such as rations, stationeries, school uniforms etc to help to ease the centre's burden. RE ITALY is the Italian Real Estate Convention. The Winter Edition, in January, is an opportunity to plan strategies for the current year. Institutional conferences alternates with casual round tables to espand your network, develop partnerships, promote your projects. The convention will have interactions between Asset Managers, Advisors, Analysts, Real Estate funds, Investors, Banks, Legals, Real Estate Networks, Property and Facility Services, SIIQ, Developers. The awards and dinner ceremony take a cue from the World Prix d'Excellence Awards and Dinner. The FIABCI-Nigeria version is projected to be a prelude to that of the world series. Through this award, projects from Nigeria could receive nominations in the world series as it recognises projects that embody excellence in all the real estate disciplines involved in its creation. It is intended to reward functionality, size, aesthetics and general construction and financing merit. Nominations are drawn, and a panel of renowned real estate professionals and experts decide on winners based on predefined indices. The « Grand Paris Express » is the future new metro ring network that will cover 200 km of new metro lines within and around Paris. Along these new metro lines, 68 stations designed by some of the most notorious architects will be the center of urban development. The “Fabrique du métro” is the brand new urban lab designed to capture the human and technical adventure that this 35-billion euro project represents. Each area of the visit is designed as a lab to test and experiment the future equipment and materials. Providing a crossroads between experience, expertise and visionaries, Domolab is a working space for constant innovation created by Saint Gobain. It offers a three-step visitor pathway, each corresponding to crucial stages in the approach to creative innovation. In the form of an interactive and cross-business center, it is a tool for creative and forward-thinking dialogue between companies involved in habitat and the construction industry’s key stakeholders (architects, engineering firms, construction companies, property promoters, etc.). As a working tool, Domolab aims to gain a better understanding of the market’s needs and anticipate trends to generate a permanent innovation dynamic. The new cinema district operation undertook by VINCI in one of the most iconic territory of the greater Paris and right at the heart of the future Paris 2024 Olympic site (to be confirmed). Paris La Defense once again demonstrated the dynamism of its property market with office take-up in 2017 of 179,600 sq m and announcements of new real estate projects. As Europe's premier dedicated business district, home to 3.6 million sq m of office space and 180,000 employees, La Défense is the world's fourth most attractive international business destination and the largest in the European Union. Speakers: Christian Nibourel (President, Greater Paris), Bernard Michel (Board, Greater Paris), and Alexandre Missoffe (General Manager, Greater Paris). The webinar is expected to take 45 minutes, followed by a 15-minute Q&A session. To participate, please send an email to info@fiabci.org with "Webinar" on the subject line. The Second Home Expo offers the most comprehensive offer under one single roof. A second home to enjoy magnificent holidays in, or to use as an investment – or both. Limited to FIABCI Malaysia members only and First Come First Serve basis! In ligt of the impact of SST implementation in real estate industry by Tuan Lau Thye Mun, Senior Assistant Directory Of Customs II Service Tax Policy and Implementation Branch, Sales and Service Tax Division, Royal Malaysian Customs DivisionSenior Assistant Director of Customs II. Has served the department for 27 years. He expert in Customs procedures such as import and export, free zones, Megaports Initiatives, inland ports clearances, passenger inspection clearances, postal goods clearances and currently specialize in GST under property, construction and professional sector. He was also being the regular for GST forum, Tax agent courses and other seminars related to GST for Royal Customs staff, corporate bodies, associations, NGOs and other government agencies. An executive evening to network, meet your peers, make new business contacts and get ready for MIPIM with fine food and live music! Online registrations open at the end of January on FIABCI's website. Habidatum will perform a webinar on March 28th, at 14:30 Paris time, intitled “Data analysis and spatio temporal visualization with GIS and Chronotope"
Hosted by a befriended organizer, these meetings are mostly visited by around 80 international, all private investors. Thursday 28 March from 19-22:00 in Utrecht the Netherlands. Ho Chin Shin is a map maker, author and a fellow of the Royal Institution of Surveyors, Malaysia. He has a professional Diploma from the Royal Institute of Chartered Surveyors (UK). Currently he is a Chairman of Ho Chin Soon Research Sdn Bhd, a property information company specialized in land land use and ownership maps, 3D Augmented Reality Maps, provides speaker for property launches, aerial photography and customized real estate reports. He also the founder of 1Authors Club. Ho Chin Soon will use old serial photography of important locations in Klang Valley and update with recent drone image. The participant can see themselves the transformation of KL over the years. He will also explain on how the future corridors will open up and the Locational Centre of gravity can proven to have moved south and will continue to do in the years to come. FIABCI-USA has secured an room block at the Grand Hyatt at an exclusive $229 nightly rate (taxes and fees not included). To make reservations visit www.hyatt.com/en-US/group-booking/NYCGH/G-DFIB or call (800) 233-1234 and reference the FIABCI Room Block. THIS EXCLUSIVE RATE ONLY AVAILABLE UNTIL APRIL 4! Important Note: Event promotion will begin next week to non-members and sister organizations throughout the New York area. Space is limited. Don't delay - Don't miss out - Book your event tickets and hotel room today! The Monaco International Luxury Property Expo 2019 is an exhibition on international high-end real estate to be held 15-16 May 2019 at the Grimaldi Forum Monaco. The event format is designed to provide maximum opportunities for exhibitors and B2C visitors alike to meet each other in person. The format has been proven to draw HNWIs (High Net Worth Individuals) and investors. • Asia-Pacific: South Korea, Japan, Israel, Brunei, Turkey, Hong Kong, United Arab Emirates, Mongolia. **not earlier than 3 month before the trip and not later than 10 days before the trip). If your country is not in the list of the non-visa countries and there is no opportunity for your country to make the eVisa, you should apply for the Ukrainian Visa in Ukrainian Embassy in your country. Please contact info.fiabci@gmail.com on all the needed support and for all the details of the event. PROVADA is the biggest real estate exhibition in the Netherlands, where stakeholders come together over a period of three days to network and to attend a wide range of events held in special forums, in the theme-based squares, in conference halls and, of course, at the individual stands. People will be awarded for their distinguished accomplishments in real estate industry at the CÄSAR Real Estate Award Ceremony in Vienna. BIS is the greatest Building and Real Estate Fair in Belgium.